Here is a quick guide to Cloud Points and Krafft Temperature. There are no apps, just some explanations. Very briefly we need to deal with two numbers that are often referred to in surfactant literature. 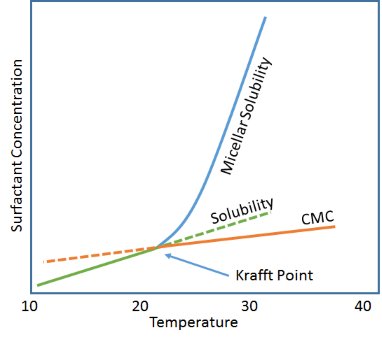 The solubility of ethoxylate surfactants is unusual because it decreases with increasing temperature. This is a result of the ambivalent nature of ethoxylate chains which tend to curl into hydrophilic coils at lower temperatures and when randomised by heat tend to present a more hydrophobic nature on average. So if you start with a tube containing, say, a 1% clear solution at room temperature and warm slowly, at a certain temperature, the cloud point, the tube will become cloudy. For pure ethoxylates the transition is sharp, for the real-world surfactants which are broad mixtures, the transition is less sharp. Who cares? They are mostly of no interest because surfactants are usually used in the context of oil/water mixes and then the interest is in the change of HLD with temperature (driven by the same effect of lower hydrophility), and so the HLD equation is more relevant than cloud point. It is depressing to see articles on cloud points that talk about tweaking them when in fact it is the HLD, which depends on the oil being used, that should be tweaked. Why measure a cloud point in water when you could be seeing how the oil/water phases change with temperature and additives? For those who are interested in water/surfactant mixes then binary phase diagrams are far more important than some relatively arbitrary (e.g. 1%) definition of a clouding temperature. At higher concentrations, liquid crystal phases dominate the discussions, not cloud points. This is the temperature below which the surfactant is, basically, a useless solid. 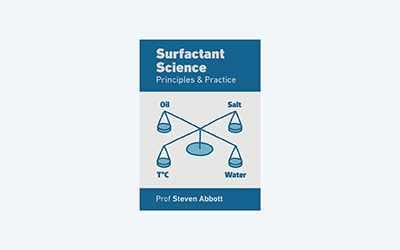 To be more scientific, it is the temperature at which the solubility is equal to the CMC, so below that temperature you cannot obtain micelles so much of the interesting stuff that occurs with surfactants cannot happen. In general, anionics don't have cloud points (their solubility increases with temperature) and ethoxylates don't have Krafft points (their solubility decreases with temperature) though this doesn't stop academics searching for exceptions. The Krafft point isn't of great interest except in a negative sense. Longer surfactant tails generally lead to better "solubilization" or, in HLD-NAC terms, a large ξ parameter. But longer tails generally lead to lower solubility in water and a higher (i.e. nearer to room temperture) Krafft point. So a surfactant that should theoretically be excellent is, in practice, a useless solid lump in the bottom of a tube. For those who like such things (the approach is generally associated with surfactant-great Shinoda so it's worth looking at), the Krafft point can be considered as the intersection of two rather dull temperature-dependent lines. For ionic surfactants (Krafft points aren't generally associated with ethoxylates) solubility and CMC both increase with temperature, but at different rates. At the point where they cross and micelles can be formed, "solubility" (i.e. the ability to get surfactant into water) increases sharply because micelles can freely grow, absorbing any extra surfactant that's added. This crossing point is the Krafft point. Of course, the image is simplified. All sorts of phase/solubility things happen at higher surfactant concentrations. The diagram, therefore, is for illustrative purposes only. It is common to find the spelling as Kraft Point, but Prof Friedrich Krafft would be upset.